We all know that most professionals, except for the most active job seekers, don’t keep their resumes updated. Furthermore, only 10-20% of individuals are actively looking for a new job. So why do career sites limit their applicant pool by requiring a resume just to get the recruiting process started? Well, employers didn’t have much choice—until today. 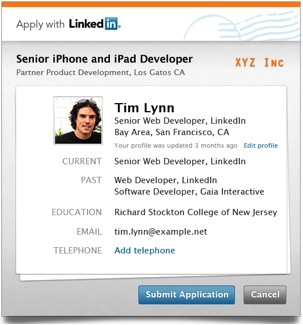 “Apply with LinkedIn” is a new plugin that lets professionals apply for jobs by simply using their LinkedIn profile. Employers can use the free plugin on their career sites and even job postings on the web to reach more than 100 million LinkedIn professionals around the world. With increased access to high-quality talent and a streamlined application process, employers can attract more active and even passive candidates to their jobs. For employers who don’t need to integrate with an Applicant Tracking System (ATS), they can take advantage of this powerful new tool today. For those who want the plugin to integrate with their ATS, several vendors already support Apply with LinkedIn and more will support it in the future. Read on to learn more about how this plugin works for employers. To learn more about the benefits for job seekers, check out the main LinkedIn blog. The job seeker experience is simple and easy to illustrate with some screenshots. 1. 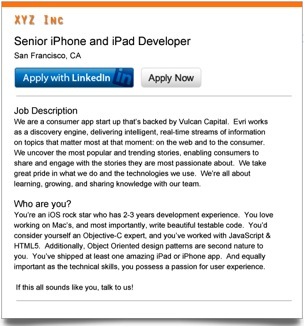 A company adds the Apply with LinkedIn button to its job postings. 2. 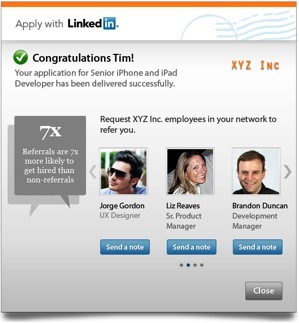 The applicant uses their LinkedIn profile, which can be updated on the fly with new or relevant information. He or she can also add contact information which is only shared with the employer. 3. Once the information is submitted, the applicant will see professional connections that work at the company who can help them with a referral or answer questions about the company. This helps both the candidate and the employer determine whether there is a good fit and helps candidates put their best foot forward. Employers can customize the experience to meet the needs of their organization. For example, you can include up to three questions and add the option of a cover letter. Installing the plugin on a web page is straightforward and can be done very quickly with the instructions on our LinkedIn developer site. Where does the applicant’s information go? One option is to have the profile and additional information sent to an email address. This is perfect for the millions of smaller businesses that don’t use an ATS to manage the application process. Read the Quick Start Guide for step-by-step instructions. If you do have an ATS, you can work with your vendor to integrate leads right into your candidate pipeline. To set up ATS integration, your vendor must support the plugin and then they can work directly with you to customize integration for your workflow. Contact your ATS and let them know you want to use the Apply with LinkedIn plugin. Visit this page to fill out a short form and we will inform the ATS of your interest and notify you when your ATS supports the plugin. One other question that we have been hearing about Apply with LinkedIn is ‘does this work with LinkedIn Recruiter and job postings on LinkedIn.com?’ No it does not. Apply with LinkedIn is designed to help you bring the benefits of the LinkedIn network to your own website or job postings (not on the LinkedIn.com site). It’s a complement to the powerful recruiting, branding and targeted job posting and matching services available for LinkedIn.com and the LinkedIn ecosystem. The hub for all of our information about this initiative is apply.linkedin.com where you will find overviews of the benefits, updates on ATS partners supporting the plugin, FAQs, detailed guides for installing the plugin, and support options. We will also be adding more FAQ information to Recruiter customer web sites. Watch this space for more updates in the future and go check out Apply with LinkedIn today!